Stepping into this glaring disconnect, Allison Trowbridge offers Twenty-Two, a series of personal letters that marries true life experiences and advice with the fictional life of the recipient, Ashley, a young woman looking for mentorship from someone one step ahead in life. The letters are sent every other month, over the forty-four months of Ash's college experience, and address a wide range of relevant topics while tying into universal themes such as the value of the journey, identity, social impact as a lifestyle, wisdom in the ordinary moments, and the profound impact of God's work realized through the way we live every day. Trowbridge subtly weaves in today's most pressing social issues-from poverty in our neighborhoods to human trafficking across the globe-inspiring a greater sense of mission in both Ash and the reader. 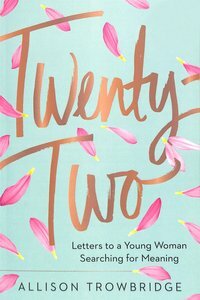 About "Twenty-Two: Letters to a Young Woman Searching For Meaning"